The #1 thing no one seems to know about in Envigado. You could aimlessly be wandering the streets of central Envigado, and it would literally pop up right in front of you. Charmingly modest from the street, an earthy structure of stone and cement. Inside, it’s pure magic. I was intrigued by a quick, almost in-passing mention of Casa de las Piedritas. When it did not pop up on Google maps, I was extra intrigued. Further googling finally brought up its #1 (via about two dozen reviews) ranking on Trip Advisor. The hours of operation vary across its few internet mentions. (We went around 3pm on a weekday.) Its business model seems to be…a private residence which rewards unexpected knocks on the door with a welcoming smile and a very storied tour of what is actually a sprawling casa, right inside that modest, repurposed front door. It’s an art museum that fully functions as a private residence. Gloria Ochoa answered the door on the day we visited. She graciously showed us through her family’s space, introducing us to her children and grandchildren by telling us about them as she showed us their spaces in the ‘house of pebbles.’ We remarked on a painting, which was permanently cemented into the wall in her bedroom, and she shared that it was of her family’s Venezuelan home, painted from memory. The casa is the dream of Gloria’s husband, Santiago. We got to meet him quickly in passing, before he was off to work on the current addition of the house. After spending part of an afternoon with Gloria, she herself seems to be part of the foundational steadiness that holds the constantly evolving structure together. 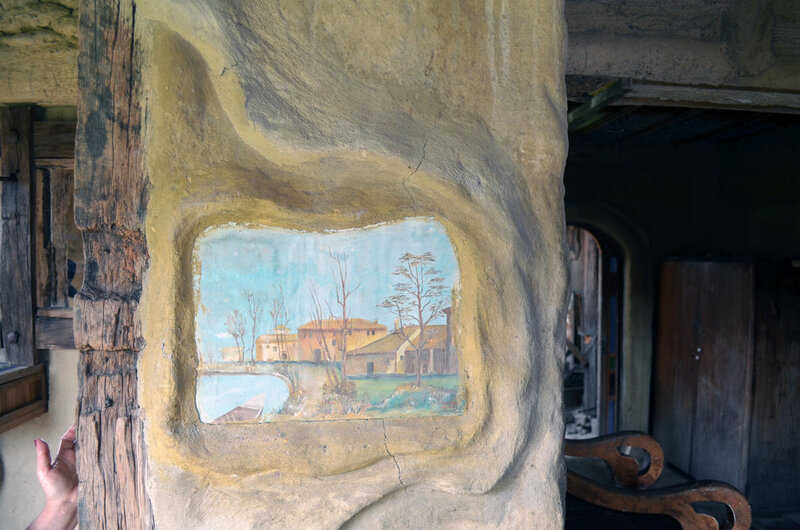 Gloria is an artist as well, and the couple constantly creates for their home. Married for 43 years, they started building 32 years ago, stone by stone. They will celebrate their next anniversary at the end of February, and Gloria proudly showed off this year’s anniversary gift, a pair of lovely shutters that close into the third level of the home. 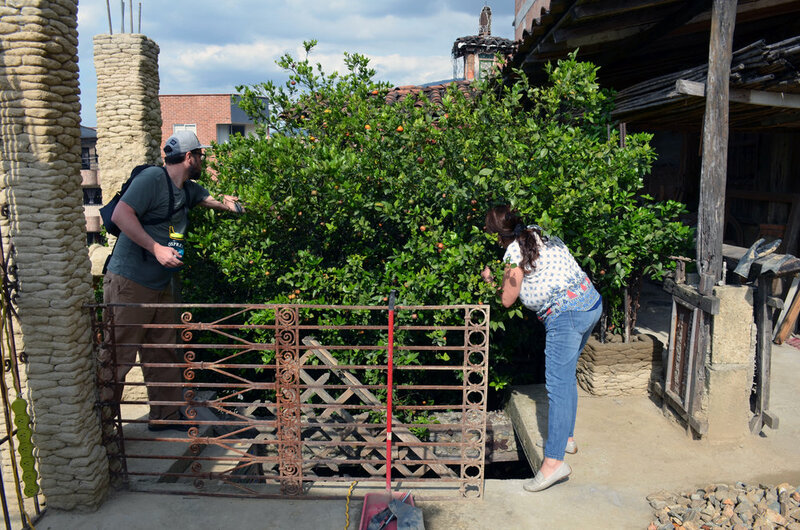 She gently demanded Sean take my photo here, holding the fruit they had just picked fresh off the mandarin tree that roots in the home. 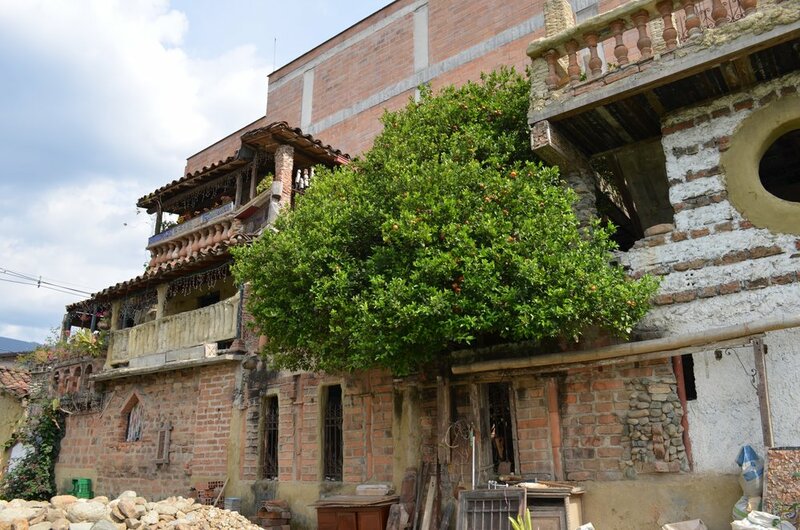 The entire home is constructed of materials directly from earth to wall, with reclaimed relics from old churches and buildings around Medellín and Antioquia. Traffic lights covers, painted eyeglass lenses, broken glass, and bright ceramic tiles add pops of color. A mandarin tree is featured as a living wall in the kitchen. Everything in Casa de las Piedritas is sustainable, and everything in Casa de las Piedritas is sturdy with love. 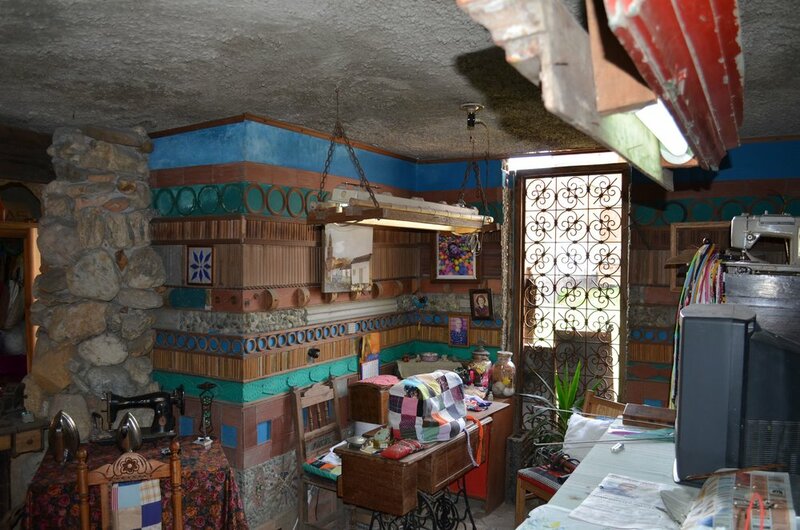 The casa has a guestbook and welcomes guests to add even more good vibes inside these walls. After our tour of the casa, Gloria offered us tea and candies while I wrote out our offerings of thanks. There is no posted admission to visit the house, but donations are suggested. The education, inspiration and time taken to give us a private tour warranted every peso. Gloria speaks no English, but she shared her stories slowly, was very easy to understand, and was a champion the few times we needed help around a word we weren’t familiar with. 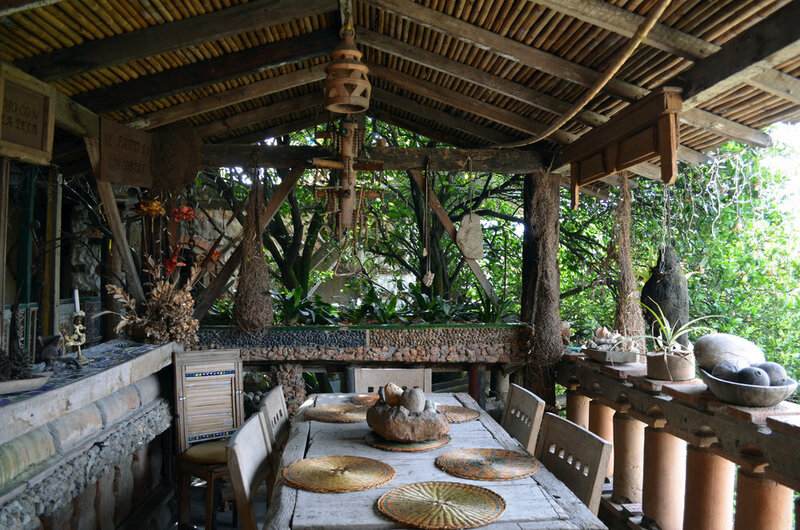 visiting Gloria, Santi, and their Casa de las Piedritas is a must in Envigado. To get to Casa de las Piedritas in Envigado: from Parque Envigado, continue east on Caldas Envigados. When you reach Calle 31, look to your right and you’ll see the casa at the end of the road. ^ and never miss an upcoming group travel adventure.